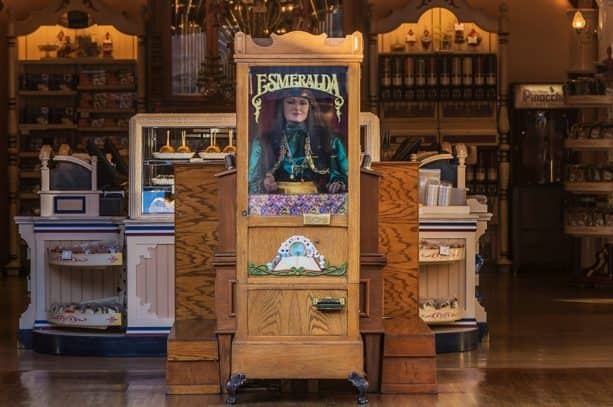 I was recently sent into Disneyland park to capture photography of the Fortune Red and Esmeralda the Fortune Teller machines. I figured the project would take about an hour. I was wrong, but I love being wrong because in those moments because I learn something new. I went out around midday and didn’t have any trouble with Fortune Red. He’s tucked away in an evenly-lit corner of New Orleans Square. I was certain that reflections were going to be tricky with Esmeralda at that hour, but figured a well-timed group of passing guests could cast a shadow sufficient to yield a usable photograph – no luck. I went back out closer to dusk that day. Alas, while it was easier to see the character, I found reflections from street lamps almost as distracting as the glare of a midday Main Street, U.S.A.
Then, I came back early the following morning and hoped I could get this picture in the can right after the park opened – the sun should still be low enough in the sky, I thought. I could see glare of morning sun crawling down the Penny Arcade wall as the clock struck 8 a.m. and the shop’s door began to slide open. I started snapping photos as soon as the door was open and enjoyed about 60-seconds of photography time before the sun was reflecting back at me. Success! Overcoming photographic challenges like this one are a really satisfying part of the work I do for Disneyland Resort. Best job in the world! Vía https://disneyparks.disney.go.com/blog/2019/01/a-walk-in-the-park-every-day-is-a-new-photographic-adventure-at-disneyland-park/ ʕ ᴖᴥᴖʔ Subscribe to me here on Youtube for more fun!